This is a speculative essay. It asks why, in a modern democracy, Australia should elect a Prime Minister who is widely and internationally criticised as overly militaristic and not that caring of the welfare of its people. Tony stopped the boats, now he wants to stop IS. Tony needs to have a slogan to cling to power with. He doesn't or can't deal with domestic issues. so a daily press release about stopping the boats/IS is what he needs. A great opposition Leader and terrible PM. I don't know where the idea that Abbott is aggressive comes from. The boy is a wimp, allowing cub scout Shorten and the girlies of the Opposition to lambast him with their childish drivel. He backs down at the slightest squeak from the Loony Left. He doesn't stop to think that he is losing support from conservatives. The aggressive rubbish just comes from the left, who think that they can carry on with the same mantras as they would if they were dealing with a really strong conservative - you know the drill: nasty right, sweet caring left - when they are facing a mere wisp of a man. I hope they get the reality of a real man like Scott Morrison in the near future. yep a volunteer lifesaver, giving up annual leave to serve the Indigenous and being faithful to his wife is repulsive to many regressives. They prefer the pseudo moral issues of banging on about the gw religion and flying around the globe using tax payers money to sprout the nonsense. And of course you must support gay 'marriage'unless your a woman like Gillard. 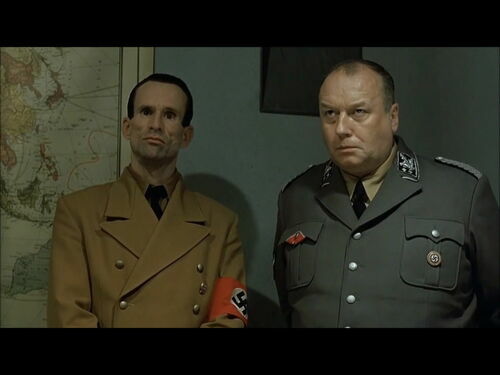 First one needs to point out that Abbott only looks like Joseph Goebbels in this photo http://img2.wikia.nocookie.net/__cb20110914210421/hitlerparody/images/thumb/d/d1/SkeletorAndBormann.jpg/500px-SkeletorAndBormann.jpg and Dutton the fat SS general next to him. But Abbott wasn't (and isn't) all there. That the Horst Wessel song is their Love Tune is totally untrue https://youtu.be/MD6oDnm43HA . Though the Black Uniforms they so admire are real. Quite agree with former posters this essay is obviously the work of a rabid leftie. Lefties cannot tell the truth as its beyond their remit. They follow the mantra that all are oppressive of other races unless they are in the crowd of low achievers who seem to make up the bulk of this nasty aberration. The left are the driving force behind the latest invasion of Europe by Islam. They defend and bolster this warlike ideology which has since it began in 550 AD, set out to dominate the planet and looks fair to do so unless we can get some back bone into the world leaders who cringe as soon as the media all mainly lefties start on hurling abuse and name calling. Tony Abbott is not really right of center at all, in fact he, like Howard is damaged, being labelled misogynist has done most of it but also the horrendous attacks from the left never let up on anything done since he came to office. And the continual media harping on all they hate about him covers up the real problems from being addressed.I cant think of any other person being subjected to such a malicious campaign in living history whilst alive and serving. Beats me how so many also are too busy to see that this can only lead to more trouble and a lowering of their own lifestyle as it can be compared to Fiddling whilst Rome burns in many ways. I hope we can get past next Saturday and the government gets a huge number of votes in Canning. It wont shut up one leftie but could strengthen the weak willies who cant see the wood for the trees in the Liberal Party. Who should start to take a long hard look at whom they allow as candidates.